Since 1993 is dogwalkservice Outlet taking care of walking dogs, so dogowners can take care of other business. We’re true professionals, working with a dedicated team of employers. In our climate controlled vans we take your dog either to the Amsterdam forest or a nearby beach. Because of the size of our company we can guarantee we’ll always show up, no mather what! Once in the forest or beach we’ll make sure that your dog gets all the time and space that he or she deserves. A pack of dogs usually consists of 5 to 8 dogs, and we always make sure that any pack forms a relaxed combination. On weekdays you can choose between a morning- or afternoonwalk; the choice is yours. If you’re interested in any of our services, please do not hesitate to give us a call. 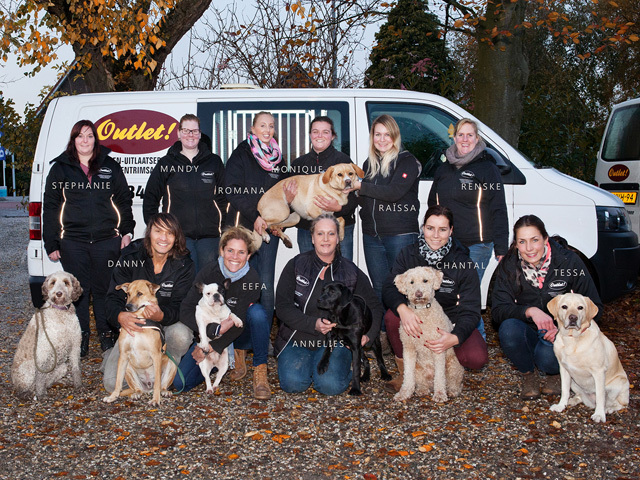 Team Outlet is looking forward to hear from you! Besides dogwalking Outlet’s core business covers grooming as well. Trimming a dog is cut, effileren, picking, stripping, shearing, thinning and / or `getting rid of old` coat. For almost every dog, it is important to go for good maintenance of the coat. Regularly trim; The old coat is removed so that the new can grow without hindrance. No time to walk your dog? Seeking a dog walking service?